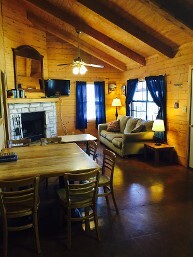 Since 1942, River Haven Cabins in Leakey, Texas, has provided a beautiful log cabin resort full of river cabin rentals for your escape into nature. We are under new management and our managers really enjoy what we do here for our guests. Each log cabin at River Haven offers a beautiful view of the river from the porch. They are equipped with central heat and air and have 2 bedrooms (with 1 or 2 baths), a living room with a fire place and hide-a-bed, DirecTV™, and an all-electric kitchen. 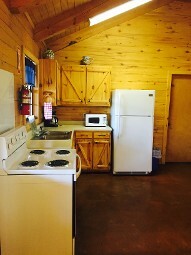 The cabins are furnished with linens, towels, dishes, and the like. All rates are based on 1-4 people per cabin, except the 4-bedroom cabin, which is based on 1-8 people with a very small charge for each additional person. For the Fall and Winter rates, groups of 5 cabins or more include a 10% discount. 6% hotel sales tax is added to the cost of the cabin rentals. All reservations made 60 days prior to arrival require payment in full and is non refundable if cancelled . All deposits are nonrefundable if reservation is not cancelled 60 days prior to arrival. 60 Day Cancellation Period: NO cancellations due to weather, and NO refunds if you check out prior to reservation period. All policies and rates are subject to change without notice. Contact us for more details on our log cabins for rent.